The newest, most classic family tradition. A woman's Bauble Stocking contains the final gift of Christmas, a thank you for all she's done. A family tradition everyone will love- her family shops for the perfect something special for mom, and the unveiling is Christmas's final fireworks. All orders of 12 or more Bauble Stockings will receive our signature wooden tree display for free. Mom makes the Christmas Magic, we all know that, but how do we say "thank you" for making every Christmas so special? 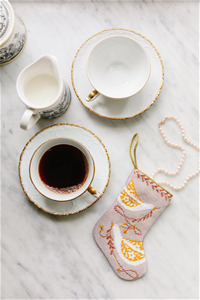 Atlanta-based Bauble Stockings is the tradition that makes sure expressing our gratitude never is forgotten, plus creates the ultimate family tradition of shopping for Mom! Mom makes the magic happen all year, especially at Christmas- so let’s do something really special in return to say “thank you”. Growing up, a small needlepoint stocking hung as an ornament on owner Kate Stewart's Christmas tree. My mom stitched it herself and it was a part of our normal Christmas ornaments we put up every year. 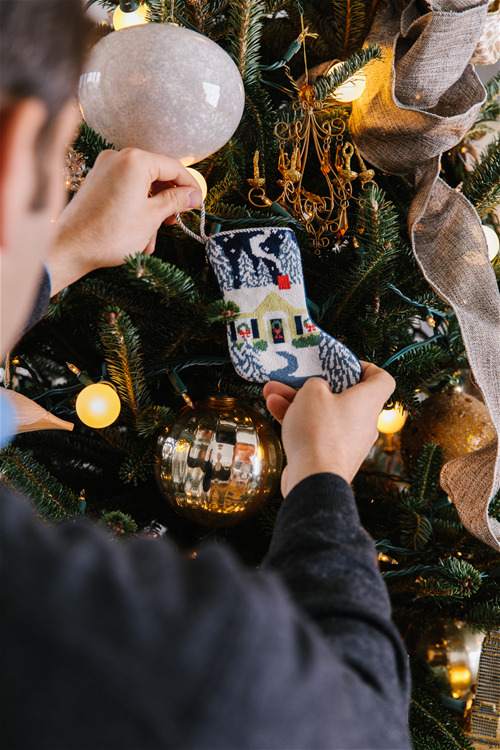 But one year, after all our gifts were opened, Dad asked Mom, “Have you looked in your stocking?” Surprised, she found a small, thoughtful present, and a tradition was born: the Bauble Stocking. Every year it's different: be it jewelry, lottery tickets, even art lessons! This tradition teaches gratitude and thoughtfulness. Mom keeps you together all year, not to mention the work she put into the holiday season. Alongside Dad, the family brainstorms ideas and goes shopping with Mom in mind. The memories of this special shopping trip wit hDad are forever etched in our memories. Having ownership in such an important gift makes the unveiling an exciting moment for everyone. As the last present to be opened, it's the perfect finale to this special holiday. Proudly made in Haiti, each stocking is 100% hand-stitched and finished by artisans who are paid a fair wage making the same as a nurse or teacher. We use the finest materials available, making this an heirloom for generations to come. The original artwork is by Sarah Watson, a SCAD graduate and Alabama native, whose fresh take on tradition makes the designs something everyone will love. 5% profit of each sale goes to the Atlanta Children's Shelter, a day shelter for homeless children so their moms are able to go to work knowing their kids are safe and receiving quality care. We believe in supporting Moms without support systems so they can build strong foundations for their family. A woman's Bauble Stocking contains the final gift of Christmas, a thank you for all she's done this year. Hand-stitched in Haiti, we pay fair trade wages meaning stitchers earn the same as a nurse or teacher. We give 5% back to the Atlanta Children's Shelter, a day shelter for homeless kids so their moms can fgo to work knowing they are safe anbd receiving quality care.